This is the latest is a series of studies that I have been conducting that look at how complex organic forms can be created emergently using simple mathematical rules for morphogenesis. Taking inspiration from the work of Alan Turing, D'Arcy Thompson and Ernst Haeckel, they use digital simulation techniques to generate structures algorithmically. The aim is to combine both the alien and familiar. I'm not trying to replicate specific forms in nature, I'm more interested in forms that may have strong echoes of biology but in provocative new combinations. Universal archetypal forms that can come from growth-like processes rather than top-down externally engineered design. All my recent works are based on a system that simulates rules for growth at the level of individual cells, based on a simple model of cells accumulating nutrient and being selected for splitting when nutrient levels reach a given threshold. Software and Visuals: Andy Lomas, Music: Max Cooper and Tom Hodge. In this film I present the same simulations as in the original 'Hybrid Forms' video, but highlight the regions where growth is actively occurring. 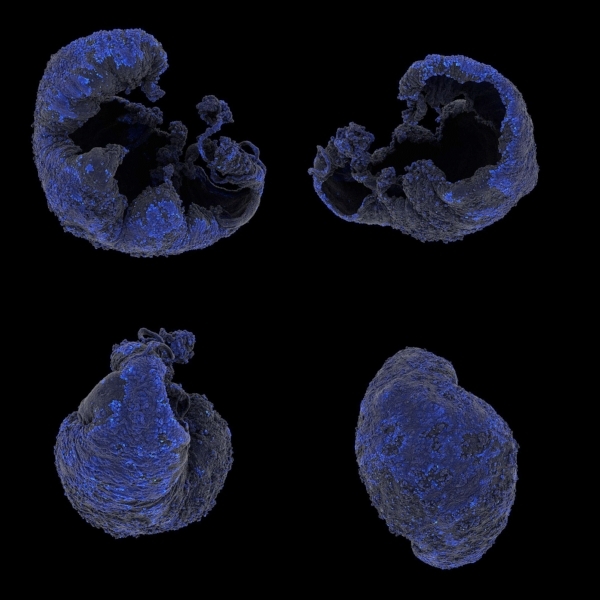 The intensity of the blue light on the surfaces is based on the age of the cells, showing the youngest cells most intensely, thus illuminating the cells as they split. The waves of new cell growth in the structures are themselves an emergent pattern in the system, with parents and daughter cells splitting at roughly synchronized times since they both have their nutrient levels set to zero after a cell splitting event, and then accumulate nutrient at approximately similar rates.